Mice are naturally attracted to garages. They offer warmth, shelter and are typically easy for these clever critters to get into. 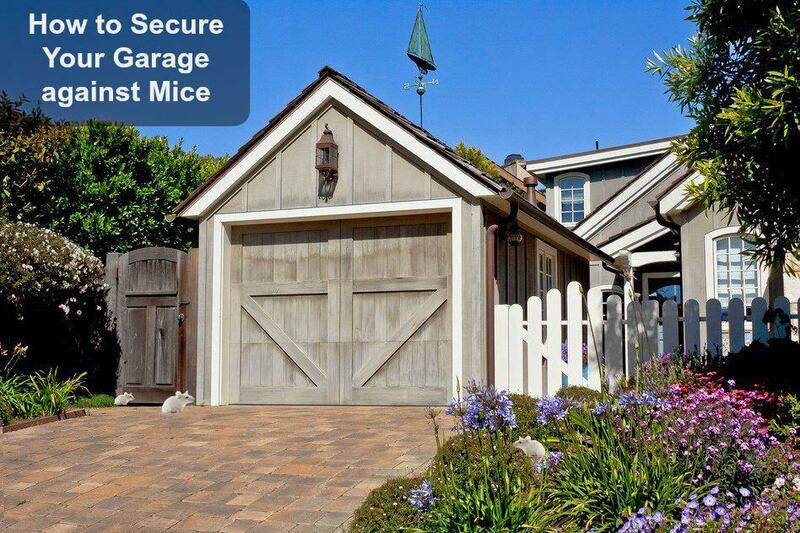 Garages are usually the first places mice will go before making their way into your home. And if left unchecked, a few mice can turn into a full-blown rodent infestation in a matter of months. Use the guide below to learn how to properly seal your garage to keep mice out and how to set up traps to get rid of any mice that are already living there. Don’t let mice sneak in & make their home in your garage. There are a few reasons why mice might be living in your garage. Warmth – When the weather gets cold, mice seek out shelter and warmth. Your garage offers a safe refuge from frigid temperatures. 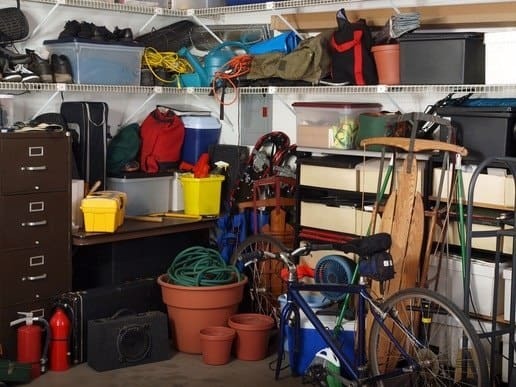 Clutter – Most garages are cluttered, which gives mice plenty of places to hide away from predators. Access to birdseed, dog food, and other edibles – If you’re like most homeowners, you probably store your birdseed, dog food and other edible food items in your garage. But if you don’t store them properly, mice can easily gnaw their way into bags and cardboard containers. Nesting Materials – Your garage is a goldmine of nesting materials for mice from cardboard to paper, cotton, leaves, debris, and other materials. Now that you know why mice love garages, you can take steps to seal your garage and set up traps. Mice love to hide in the clutter of our garages. The best way to get rid of mice is to prevent them from getting into your garage in the first place. There are quite a few ways these pesky rodents may be entering your garage, and you’ll want to take steps to seal and reinforce these areas. Garage doors are the simplest and easiest way for mice to get in. If mice have chewed through the weather-stripping on the door, a product like Rodent Guard can help prevent them from getting back in. These guards are made of metal, so mice can’t chew or gnaw their way through. Vinyl or rubber sweeps or thresholds can also be used to eliminate gaps under the door. Here are two products to fix your garage door if the mice are using it as an entrance point. Garage Door Thresholds. This is essentially a raised rubber bump that you install at the point where the garage door hits the ground. It helps to close any gaps left by your existing weather stripping. In addition to pests, it is intended to keep out water & wind to help insulate your garage and minimize your heating/cooling bills. Sensible Solutions makes a solid product, just be sure to pick up some Liquid Nails to make sure you have enough cement to attach the threshold to your driveway. Garage Door Replacement Vinyl can be used to fix the bottom of the door if it has been damaged either by wear or those pesky critters. This works on the metal roll down type doors. The vinyl slots are inserted in the metal track located on the bottom of the door. When selecting the size to buy, be sure to look at the track size as well as the width of the door. A little WD-40 will help make the installation process easier. Seal dryer vents to keep the critters out. Access holes for plumbing or vents are another possible entryway. Tighten any seals around vents, drains, and pipes to prevent access. A popular vent guard called Deflecto is also a great way to keep mice out of dryer vents. Air conditioners. Check air conditioner connections and make sure they’re tightly sealed. Mice can squeeze through gaps as small as a fingernail, so poorly sealed connections are easy for mice to get through. Sealing your garage is a great way to prevent rodents from getting in, but how do you get rid of any mice that are already living in your garage? Traps and bait are a simple but effective solution. Traps are one of the most common ways to get rid of mice, and they work particularly well in garages. But there are a few things you should keep in mind before you set the bait. Traps that use poison are hazardous to pets and kids. See our article on using mouse poison safely. Spring traps can injure children and pets – especially if you use a tasty treat, like peanut butter, as bait. You’ll need to dispose of the body, and you’ll need to avoid contact with the mouse. Remember, rodents carry parasites and diseases. Glue traps won’t kill the mouse. Instead, mice get stuck and starve to death. That being said, setting up traps is a fairly simple process. And because the mice are in the garage, you should have a much easier time keeping kids and pets away from the area. First, you need to determine where the mice are getting in, or at the very least, where they like to hide. Droppings are a clear indication of entryways or hiding spots. Place the bait in a location you know the mice frequent, ideally close to their nesting location. Along the walls, in corners, and under furniture are all good locations. Use effective bait. Mice may love cheese in cartoons, but they aren’t big fans in real life. Foods like peanut butter or chocolate are much more effective. Check the trap(s) frequently to see if the mouse has taken the bait. If you’re using a humane trap, you’ll need to release the mouse at least one mile from your home. If you’re using a traditional trap, you’ll need to dispose of the body quickly. If you have pets or kids, make sure that they cannot access the traps, or consider choosing a trap that’s non-toxic. Humane traps are also a smart choice for families with kids and pets. Fill a bucket halfway with water. Drill holes into each flat end of a soda can. Drill two holes into the top of the bucket on opposite sides. Thread a dowel through the bucket and through the soda can holes. The can should hover over the middle of the bucket. Bait the can with peanut butter or chocolate. Add a ramp, so mice can easily get up and onto the soda can. When the mouse jumps onto the soda can to take the bait, the can will spin. The mouse will fall into the bucket of water and drown. See instructions and photos of a similar soda can mouse trap at Bob Villa’s How-to Guides. Place mothballs in vented containers and place them in the corners of your garage or areas you know mice frequent. Apply peppermint oil to hiding places and entryways. Get a mouser cat or attract barn owls to your yard. If left unchecked, a single mouse can lead to an infestation in weeks or months. By tackling the problem early on, you can eliminate the mice in your garage and prevent them from coming back. Sealing your garage and setting up traps in the right locations is essential.